During the holidays I always have the esteemed honor to talk to many of the graduates belonging to my clients- graduates by the way is the term I coined to refer to those that have crossed over. Out of all those graduates I talk to, in all the messages they so graciously allow me to translate, they all have such similar themes and messages, the theme of time with their loved ones. 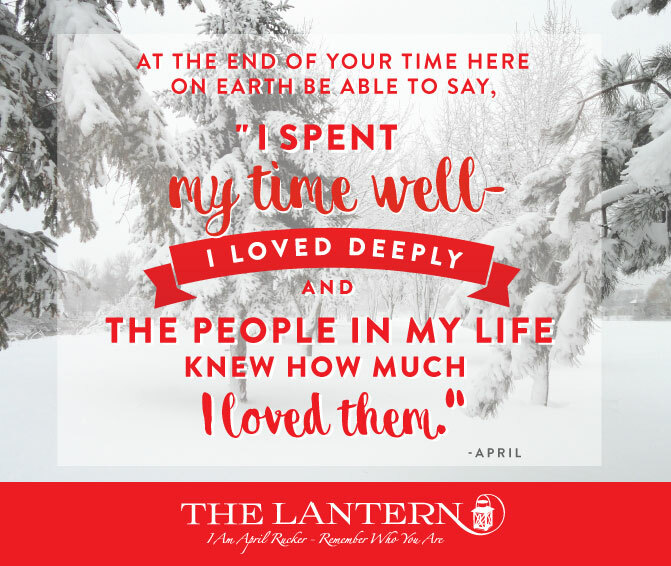 I’ve never had a graduate say to me, “I wish I had spent less time with the people I love.” No, they speak the opposite- they talk of how much they cherish the time spent with the ones they loved, how they wish they had spent more time with the people they loved. They don’t talk about how they wish they had made more money, been famous, or about how they wished they had closed a business deal or fit into that size of a dress. They speak of love, they speak of time with their loved ones. So while you are here on earth, spend time with the ones you love. Not the ones you feel obligated to spend time with, the ones who light up your day- spend time with those. Make it a priority. On the day of your graduation, yes there may be talk of your accomplishments, your legacy- but when the talking of those accomplishments fades what will be left in people’s hearts and minds long after you have gone is the time, the love, those special moments only a few of you will share together, and the way you made people feel in their hearts. Happy holidays from one magical heart to another! Stumble out of bed throw on the ole’ sweatshirt and take the dog out, alarm beeping and your tired again, climb in the shower grumbling to get ready for work, start thinking about the person who didn’t call or text you back, stuck in control of how your day should start, rushing around and running late again, pull the covers back over and hit snooze. Any of these sound familiar to how your starting your day? 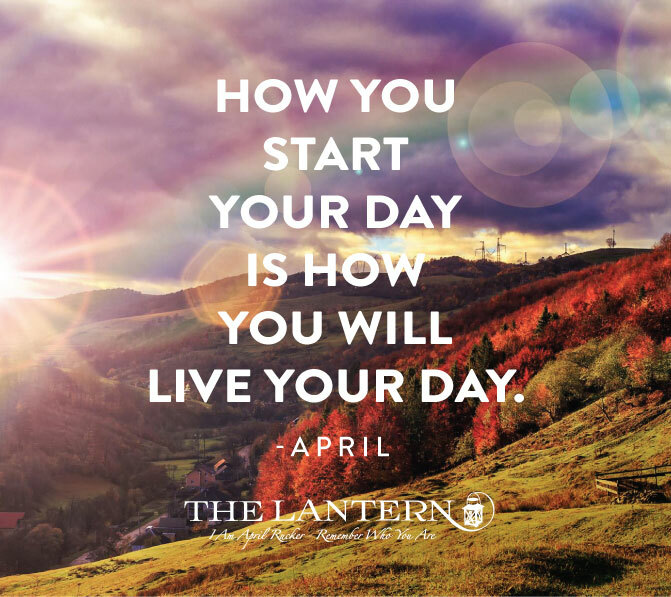 How you start your day determines how you will live your day. These first five to ten minutes of waking are some of the most crucial moments to how your day will manifest and evolve. It sets the tone for the entire day. So this next week try some different things upon waking, see which ones work for you. Which ones make you want to hop out of bed, excited, giggling, ready and open for the day. As soon as you open your eyes ask your bubble to be changed. Visualize the energetic bubble around you dissolving and a new bright shiny bubble coming around your entire body. Ground yourself. Visualize a cord flowing from your spine into the earth right into Gaia’s hands. Express your gratitude, gratitude for yourself, for your team, for the universal forces, for nature, for the contrast, for your guides and angels that are on this planet supporting, guiding and loving you. Writing release: Purge emotional writing (write for 12 minutes everything you are feeling and thinking and then take the paper and burn it), artists way morning pages (3 pages of continuous writing every morning). Mediation 5-20 minutes, this can be sitting -open eye- walking meditation- guided meditation. Move your body… stretch, do a little yoga, go on a walk. And now have the amazing day you co-created with the universe!!! You will get out of the day, how you start the day. This is your responsibility to set the tone, to set the intention. A Lakota Legend mixed with a little magic from the Lantern. Many moons ago when the world was still very young, the plant and animal life was enjoying the beautiful summer weather. The plants swayed in the sun while the animals drenched their bellies in the sun, they all danced with the butterflies and listened to the symphony of the crickets while watching the shooting stars of summer . But as the days went by the sun did not shine as long, autumn was slowly beginning to set in, the weather became colder with each passing day. The grass and flower folk were in a sad condition, for they had no protection from the sharp cold. “We’re so cold grandfather sky, grandmother earth can we come burrow with you and the moles under the earth?” But each day seemed a tad colder, Just when it seemed that there was no hope for living, he who looks after the things of His creation came to their aid. Great spirit said, that the leaves of the trees should fall to the ground, spreading a soft, warm blanket over the tender roots of the grass and flowers. To repay the trees for the loss of their leaves, he allowed them one last bright array of beauty. That is why, each year, during Indian summer, the trees take on their pretty farewell colors of red, gold, and brown. As you notice the changing leaves, think of the year, the harvest, the scenes each of these leaves have seen. What they have held space for, what they have honored. 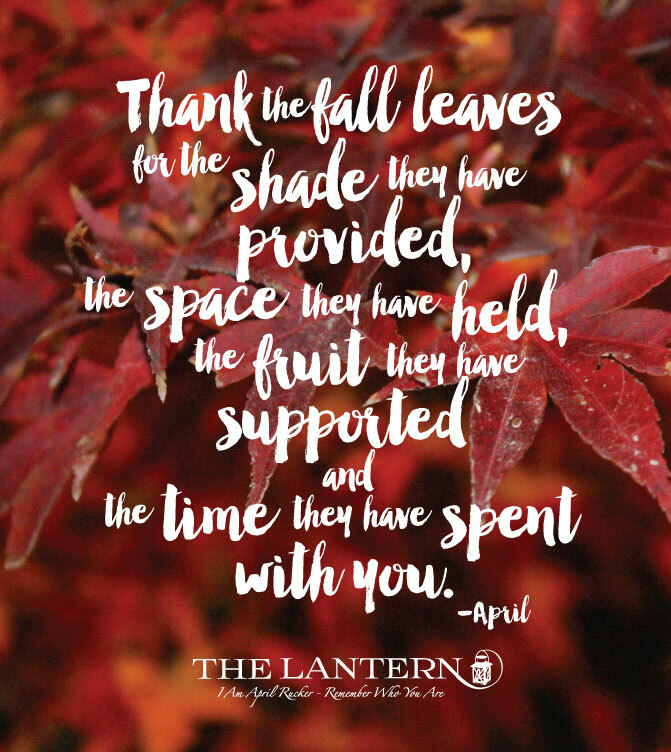 As the give their grand finale of all of their beautiful colors, these are their grand farewells of love, honor, respect, their prayers and blessings to you and the earth and a final reminder that they will see you early next spring with their new leaves. After this final display the leaves turn to their appointed task-covering the Earth with a thick rug of warmth against the chill of winter. Creating a beautiful warm blanket of beautiful colors for Mother Earth and the plant and flower folk. The other day in a session a clients “graduated”/crossed over mother came into the session to explain to him a perspective of what’s going on in his life. It was such a beautiful explanation and expression of truth I wanted to share it with each of you. 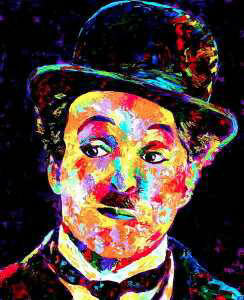 She explained the he was standing in between the threads of a weaving loom while a beautiful tapestry was being woven. And that he needed to take a step out of the tapestry to get a better and bigger picture of what was being woven. 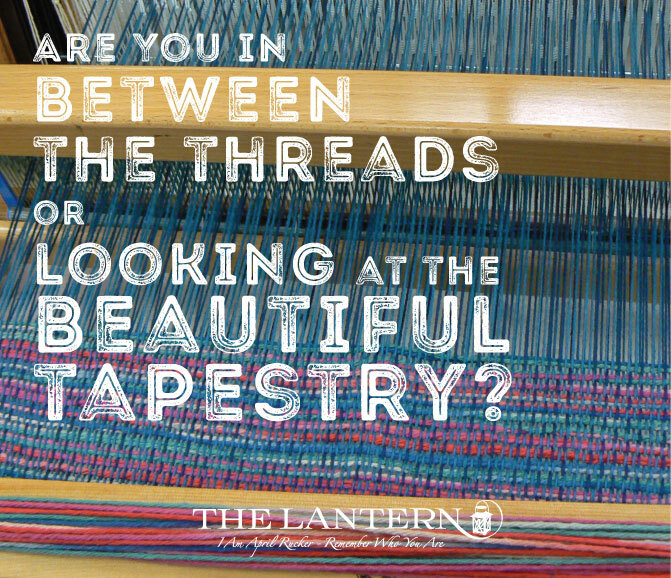 Very often we find ourselves caught in the soul loom, while the threads of our tapestry are being woven. The threads of death, loneliness, feeling lost, loss of direction, being fired from our jobs, births, illness, divorces, marriages, etc.. Those threads start weaving around us so much so that those hundreds of threads began to look overwhelming and paralyzing. Picture yourself standing in a room with thousands of threads and strings actively moving aground you. The threads stretch around you, tangle you up and keep you from seeing clearly in front of you. Everything from this perspective would seem daunting and exhausting. If we are in between the threads being woven, we feel lost, tired, overwhelmed, wondering if anything is going to start moving forward. We question what the meaning of all of this we are experiencing is. Take a pause here and think of a situation, task, experience you feel perplexed or overwhelmed by. Now ask to see where you are in the weaving of this situation. Are you in the threads of the soul loom, attached to one of the threads are you smushed inside an already woven piece? Now pause and ask your soul and your higher realm to lift you from the perspective and point of balance you are now in and move you into a bigger perspective. Ask them to show your the tapestry that’s being woven. Let your mind relax and see the beautiful tapestry that your soul loom, the universe, is weaving for you right now. With this perspective, outside the weaving loom threads, you can see the over view, gaining a better eyesight and soul sight of what is happening. Also, another cool thing from this perspective is that you can make changes to what’s being woven. Maybe you see some adjustments or shifts of threads you would like to make. Whenever you find yourself overwhelmed, wondering “what in tarnation is going on”, remember this perspective of the weaving loom and pull yourself from the threads and look to the image of the beautiful tapestry your soul and the universe are weaving. Take the bigger perspective of your soul loom, it’s a stunning tapestry if only you will see it. As well as a beautiful and thorough form of repair, Kintsukuroi has a deeper philosophical and spiritual significance. 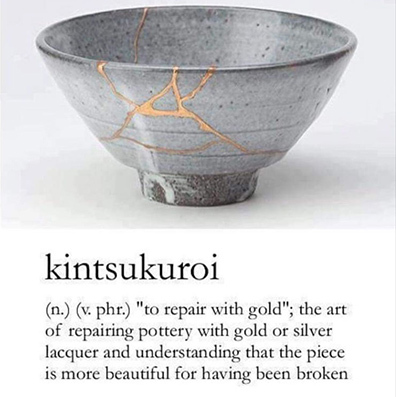 The mended flaws become part of the object’s design, and some people believe the pottery to be even more beautiful having gone through the process of being broken and repaired. To go back to the origins of Kintsukuroi, we travel back to mid 1500 Japan to the story of a military ruler who had a much loved tea bowl. One day during a gathering a servant accidentally dropped the beloved bowl and it broke into 5 pieces. The gathering became silent…. for fear that the leader’s temper would erupt, another guest made a light hardy joke lifting the rooms laughter and the military ruler began to see the significance of the moment as all eyes were on him. He made a choice in that moment to honor the actuality the beloved bowl had just experienced. The military leader found a man that could use gold laquer resin to mend the bowl. As the bowl was mended with beautiful gold strands running through it, it had become more beautiful and cherished now than it ever was before. This story goes on to say that instead of the break “…diminishing [the bowl’s] appeal, a new sense of its vitality and resilience raised appreciation to even greater heights.” The bowl had become more beautiful for having been broken. 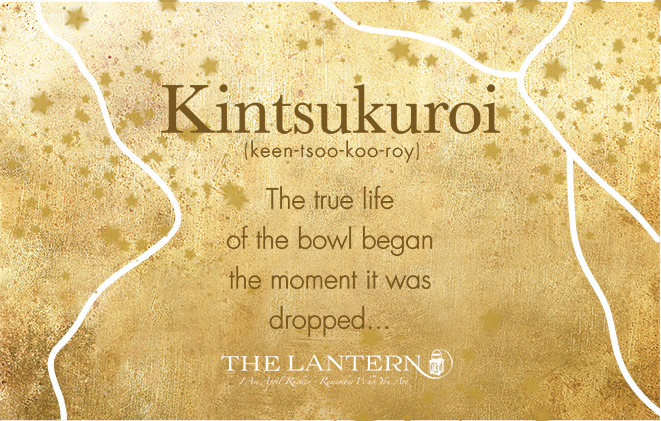 The true life of the bowl “…began the moment it was dropped…”From that day onward, mended bowls have been used and cherished for generations in Japan. Through kintsukuroi, the cracks and seams are merely a symbol of an event that happened in the life of the object, rather than the cause of its destruction. Like beautiful bowls, plates, tea ware, and cups we also endure our breaks, our cracks. Often times things seem irreparable, destroyed and debased. Often during these breaks and cracks our old limiting beliefs of shame, self sabotaging ways, abandonment, fear, failure… etc. come in. Often we want to take the “broken bowls”/ experiences/people and throw it away- leave it broken, and just have that brokenness out of our sight, so it’s out of our mind. You can step out of the way and release those limiting beliefs- surrender those cracks and breaks, you can begin to weave golden threads through all the cracks in your heart, your mind, your body. Spirit can perform kinsukuroi on all the broken pieces of you, if will just step out of the way, ask and receive. Simply say: “those beings of the highest vibration available to me now, I ask you now to come in and perform kintsukuroi on my: heart, mind, business, relationship, Heath, childhood trauma. Sit back and just be with this moment, for 5-10 minutes, as your team begins mending all of those holes, breaks, and wounds. As the golden lights of divine love come forward to offer you healing, Imagine beautiful golden liquid being poured down your entire body. Watch where the liquid goes, notice how it feels as it moves through your physical body, emotional wounds, and memories. Receive this repair modeled after the ancient Japanese art of kintsukuroi. The breath is the link between mind and body, soul and body, earth and body. Your breath is a direct indication of where you are mentally, physically and emotionally. 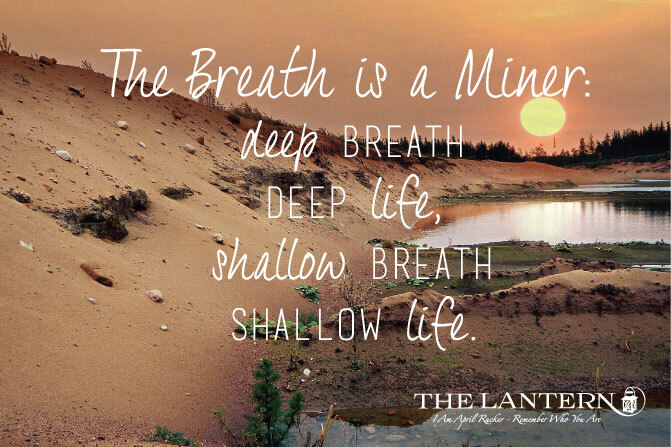 The breath is such an invaluable tool that it used for diagnosis in several Eastern medical traditions that have been practiced as far back as 3000 BC. Fundamentally, we can change our “condition”, our perspective, heal and release imbedded emotions by changing our breath and our relationship to our breath. The capacity to transform the mental, physical and emotional components by simply addressing the breath is a core principle of the science of breath work. How deep is your breath? Are you conscious of it? Do you clutch for air at your clavicle when you think about certain things? Can you fill your belly full with a breath? Do you have a hard time catching your breath or retrieving the breath in the depth of your belly? How long has it been since you really acknowledged the powerhouse that is breath? Deep breath deep life, shallow breath shallow life. At the base of our diaphragm, where those deep breaths travel to and where the deep breath must be retrieved from, is where trapped energy pockets of trauma, emotions and unresolved memories are stored. This is place where deep and often unacknowledged emotions are, they hide like little bats in the back of a cave. The Maori have a technique using pressure to release the toxicities in this spot of the diaphragm and breath work can help to release them as well. The breath allows more for the emotions of these toxic experiences to release. So how do your start working with the breath, working with it so you can achieve its full hearing potential? Here is a simple exercise to get you started. Set a time for 10-15 minutes. And for 3 weeks, breath in 1-2-3-4-5 and out 1-2-3-4-5, you can count in your head to five as you adjust to this process. You can have your eyes focused in a downward gaze, or keep them closed. Try it both ways and see what feels like a deeper process for you. For ten to fifteen minutes every day just be with your breath. Keep it simple, allow the breath to be the powerful archeologist that it is. The breath is a powerful miner and will dig up what needs to be addressed. See what emotions come forward. What thoughts, memories and unaddressed components come up. Do you notice you are comfortable or uncomfortable while doing this exercise? Do you feel a need to add something else-? does your mind need distractions of music or wanting to add something else to the exercise? does your ego say this is too simple? Acknowledge all of these thoughts, honor them … but keep it simple. 10-15 minutes a day – breath in and out. Just let go and give it a try. So many times these thoughts, questions and frustrations come up for us with other people. We feel unheard, unseen, not validated, angry, irritated, annoyed etc…. But I’m here today to let you in on a big secret that could change the way you view everything, everyone and yourself. Everyone, yes everyone, is doing the best that they possibly can. 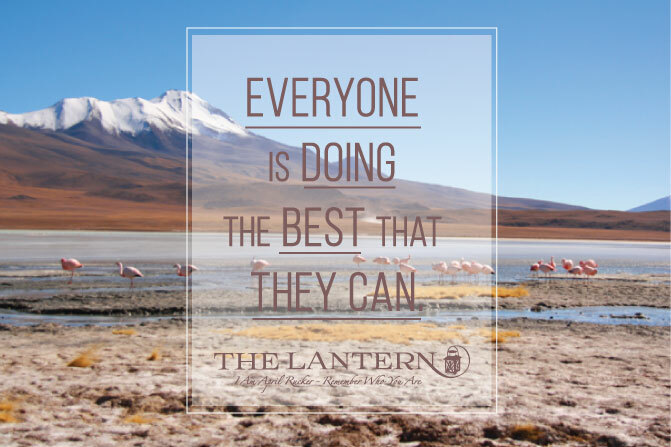 What about that person that just flipped you off in traffic, or the friend that screamed at you, or the partner that is shutting you out- yup, they are doing the best that they can. When we are feeling scared, insecure, or judgmental we can be quite critical of other people. And these judgements honestly don’t get us anywhere- they actually leave us feeling worse, stalled, playing the victim and feeling walled off. Pause now and think of someone you’ve been struggling or frustrated with or angry at… Picture them/the situation in your mind and just say out loud, ” they are doing the best that they can, if they could do better they would”. Whether you believe that or not that statement alone gives you a different lens to see the situation. Now check back in to what you feel about them or the situation. Now picture a situation you wish you handled differently and placing your hand over your heart say out loud, “at the time I was doing the best that I could”. How does this feel? 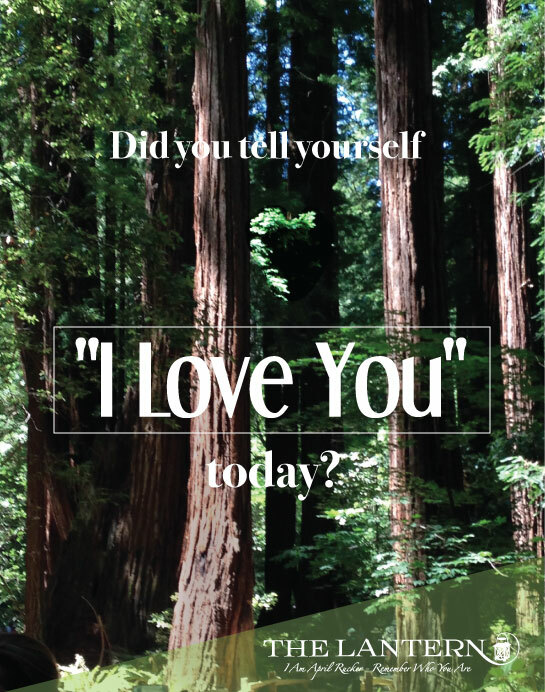 How does it feel to be gentle with yourself and alter your viewpoint of yourself. Now this perspective isn’t a cop-out or a free pass for consistent poor behavior, or an entitled narcissistic view point. Believing you and others are doing the best that they can doesn’t mean there isn’t a need for responsibility and accountability. But it does allow the space and forward moving momentum to transform the perception and energy of the situation. 1. Alter how you relate to yourself “We don’t see people how they are, we see them how we are”. So if your seeing something in someone else you don’t like, pause and ask how that thing you don’t like, or that makes you feel uncomfortable relates to you. Alter how you relate to yourself and the shifts around you will be profound. 2. Be gentle with others and yourself. Gentle means being moderate with action, effort or degree-being kind and tender. 3. What we look for we will find. If your expecting someone to not step up, to not take responsibility then that is most certainly what they will do. When will allow someone to rise to the occasion you will be surprised what can be fulfilled. 4. See the other persons point of view. You have no idea the other persons perspective, intentions, background, patterning… You yourself have perspectives, backgrounds and patterning that form your Lens of perception. 5. Be the straight shooter, Honest communication. All this nice nice pacifying and vague conversation has to stop- it’s not helping anyone or anything grow, evolve or feel safe. I often find when someone is being vague or nice nice in conversation, it’s bc of two things- they either aren’t clear what they are feeling/what their needs are- or they feel anxiety over expressing their actual truth. Pause, own your perspective and communicate your experience, needs, and feelings. Honest communication provides movement forward rather than riding the middle. 6. Acceptance. “Happiness can only exist in acceptance” George Orwell. Really accepting everyone is truly doing the best that they can can change everything. Try to start incorporating this mindset into your life, do this step by step- bit by bit until its comfortable. It will relieve a lot of stress and unnecessary thought process by lightening the mental and emotional load between human interactions. Today all day with every interaction try to hear yourself exclaim, Everyone is truly doing the best that they can, I am doing the best that I can! A couple of things come to mind, one of my favorite quotes “relax nothing is under control” and secondly and most importantly the power of presence. Let’s say you ask and get 58%. Well that means 42% of you is off somewhere else, maybe thinking about the future or past, maybe thinking about a conversation this morning or maybe part of your body is hurting, your focusing on a year from now, and a myriad of other things. figuring out where the rest of you “is” is not our focus right now, just determine how much of you “is” present. The most powerful you that’s ever been on earth at any time is you right now at this exact moment. The you right now reading this is the most powerful you that’s ever been on the planet. You five minutes ago and you in the future a year from now is not as powerful as you are right now. When you recognize your power at the present moment as the most limitless co-creator that’s ever been on earth you stop thinking about the – when I have this I’ll do that, once I accomplish this I’ll go there, if I would have only had that this would be different, I should have done that and then this would be like this- those are thoughts outside of presence, thoughts that have no power or truth to them. Our true power comes from absolute presence. Ask yourself how present you are. Ask for a percentage. Acknowledged the percentage you get and don’t make it right or wrong, it just is. Stop and listen to the sounds around you, the movements running through your body, how your breath feels, gently acknowledge what’s happening within you and around you right now, for a couple of minutes just be, observe, breath. Now ask yourself again what percentage of you is fully present now. Welcome to the beginnings of presence. It really is this simple. Notice any differences you feel in your body right now, in your mind and the thoughts running through your head. There is a song by medicine for the people called father mountain, at the end of the song he’s asking what kind of power is in me, then he starts to feel that fire- that presence that’s in him. In that line it is a perfect example of the recognition of self that comes from complete presence. Presence, This is the place we create our reality from in its highest vibration. If you are co-creating from less than presence your life will reflect it. You have the choice to be present, to co-create from full presence. With every moment, every thought create from pure presence; the clarity, action, and direction that comes from this will blow your mind. It takes some practice to be fully present so just start asking yourself a couple of times throughout the day how present am I right now. And go from there. 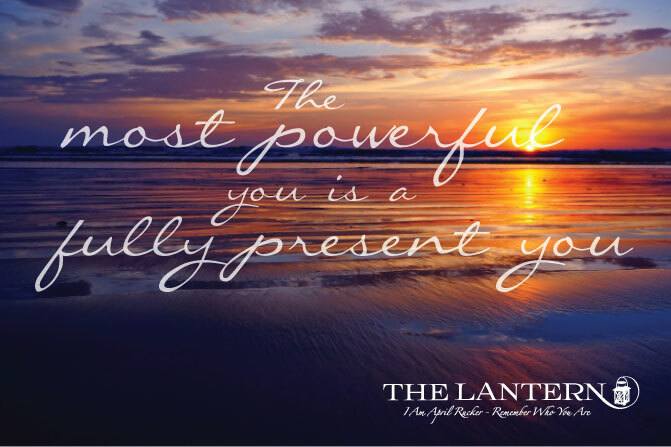 And remember the most powerful you is a fully present you! exactly right moment, so I could be calm. food, people, things, situations, and everything the drew me down and away from myself. At first I called this attitude a healthy egoism. happening.Today I live each day, day by day, and I call it FULFILLMENT. 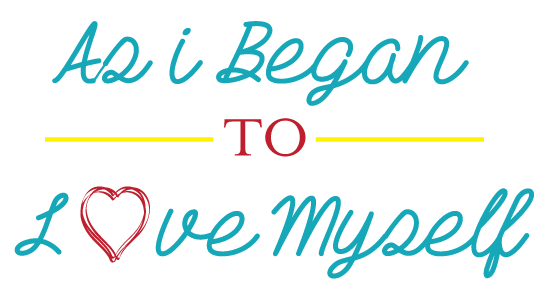 As I began to love myself I recognized that my mind can disturb me and it can make me sick. But at I connected it to my heart, my mind became a valuable ally. Today I call this connection WISDOM OF THE HEART. crashing new worlds are born. After years of searching for a spiritual teacher, a healer, a lantern, I finally took one of Gandhi’s messages to heart. I became what I needed. I became the change I wish to see in the world. I am a change maker, an ovate, a wise one. I am a soul who remembers who I am. © 2019 i am april rucker.